As every gardener knows, clay pots are necessary if you want to have beautiful potted flowers. Unlike other pots, clay pots are much healthier for the environment and help your plants grow better. 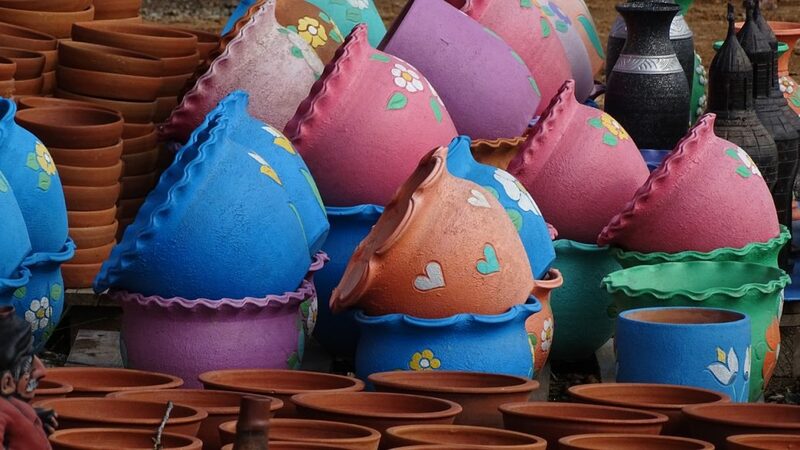 Clay pots are not only useful for planting flowers, but they also make a great craft project. From painting them with adorable patterns to transforming them into a useful household item, clay pots are so fun to work with. Clay pot crafts are also very easy to make. 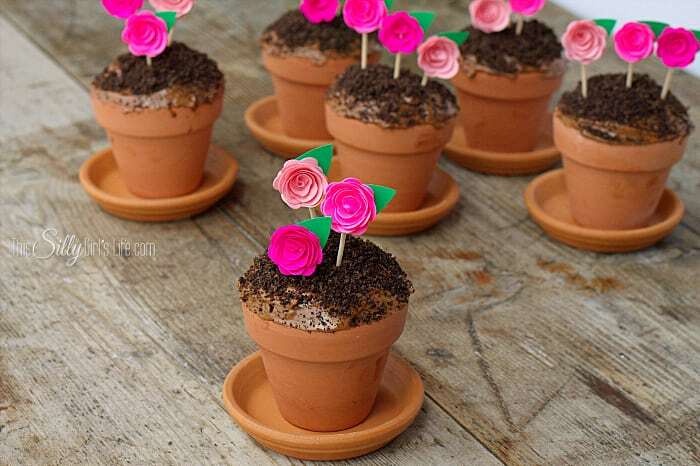 Even the youngest of children can have fun helping with these clay pot crafts. In this day and age, it can sometimes be hard to get your kids to have less screen time. If you have been looking for an easy craft that the entire family can do together, read on! In this article, I'll go over the best clay pot crafts to do with your kids. Let's begin. Watermelons are like a symbol of summer. During the hot days of summer, it is common for people to eat slices of watermelon. 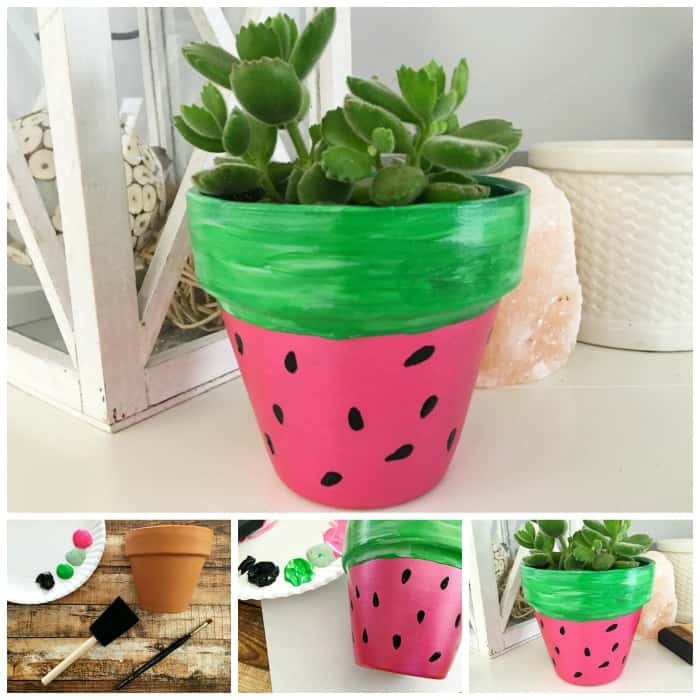 Because watermelons are so popular during the summer, painting watermelons on your clay pots is a perfect idea. This adds a little color to your flower pots so that they look nicer on your porch. All you need is a terra cotta pot, paintbrushes, and the following paint colors: Pink, light green, dark green, and black. Begin by painting the entire pot pink. You'll need a thick brush for this. Let it dry. Continue by painting the rim of the terra cotta pot dark green. Once again, let it dry before you continue. Use a small amount of light green paint to paint the rim of the pot. This will make it look like the outside of a watermelon. Finish your clay pot by painting on the black seeds. These candles are so easy to make and can be used in your house or backyard. All you have to do is paint the pots, turn them upside down, glue on terra cotta plates, and add your candles. Make sure you are always around when the candles are lit. 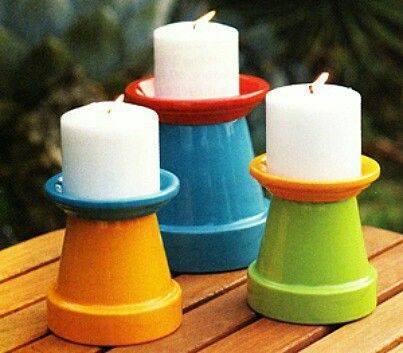 While clay pot candle holders are fun to make, you can also use clay pots to make the candles themselves. This idea can also be used with other items, such as a jelly jar, seashell, and even a lemon skin. To do this, close the drainage hole with a penny. Next, place the wick in the pot, and then tie it to a twig. Set the twig on the pot. The twig is what will keep the wick in place. Melt the wax and pour it into the candle. Let the wax cool until it hardens. Cut the wick down to about 1/4 inch. 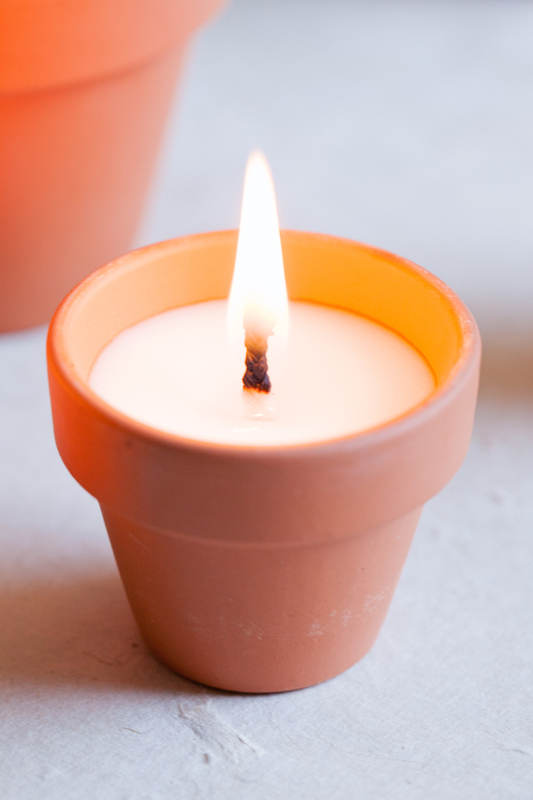 Enjoy your new clay pot candle! This next idea is not necessarily a craft, but it is still a great way to put clay pots to good use. These flowering cupcakes can be given away as gifts, or you can keep them for your family to enjoy. Here are the instructions on how to make it. Preheat oven to 350 degrees. Mix cake mix, water, oil, and 3 eggs in a large bowl with hand mixer on low speed for 30 seconds. Turn it on to medium speed a mix well for 2 minutes. Pour into terracotta pots that are set out onto a sheet tray. Make sure pots are washed thoroughly and dried completely. Pour in batter 1/2 of the way to 2/3 of the way up, do not overfill. Bake for 19 minutes or until a toothpick inserted in the center comes out clean. Place the sheet tray on a wired rack and let cool completely. After cooled, trim off any excess cake that flowed over the top if that happened to you. Make the frosting and place a heaping tablespoon on top and smooth out with a knife. Add a sprinkle of the Oreo crumbs. Decorate as you wish, serve with a spoon and enjoy! Replace your garden gnomes with these adorable clay pot people. Although they require a little more work to make, they are definitely worth the extra effort. Your kids can help you design the "person", as well as help draw the face. And for the hair? Plant your favorite flowers on the top pot so that the leaves look like hair. This is a fun project for the entire family and one that your kids will love. 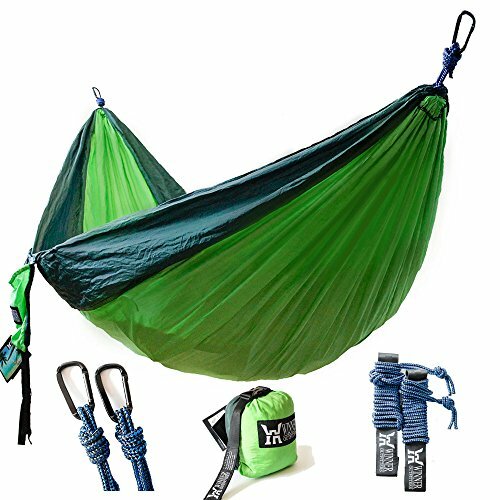 There are so many different designs you can use. You could make a scarecrow, Raggedy Ann and Andy, children, a farmer, or just regular people. You can also make lots of clay pot people. Get creative and have fun! You can find the tutorial on how to make these clay pot people at Goods Home Design. 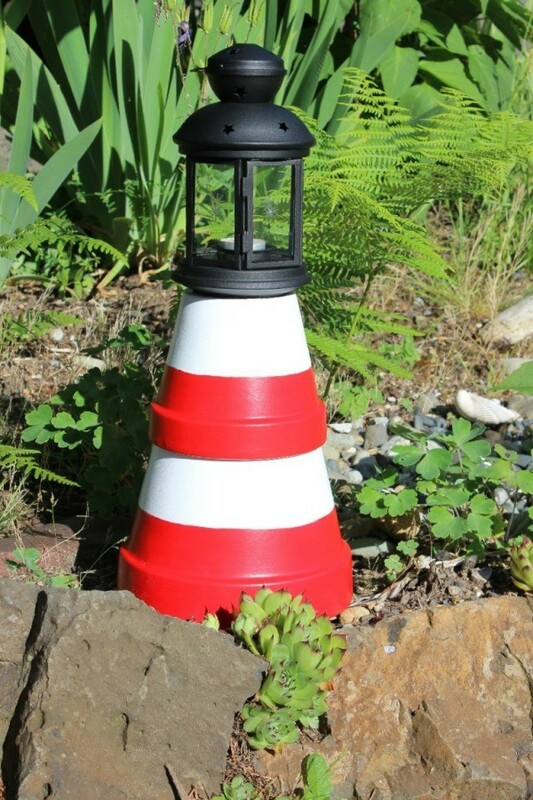 This adorable clay pot lighthouse is perfect for decorating the garden, your backyard, or even inside your home. It is also very easy to make. Your kids will most likely enjoy helping you with this project, as it is very easy and fun to make. You can paint the clay pots any color you'd like. 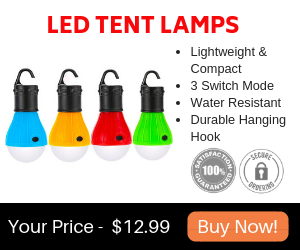 Basically, turn the clay pots upside down, and glue a lantern on top. You can make your lighthouse as tall as you want. Some people only stack two clay pots on top of each other, while others use three or four pots. This is one of the easiest clay pot crafts to make, as it doesn't require much time to make. Are you constantly losing your silverware? If so, then this terra cotta silverware holder may be exactly what you need. You can label each clay pot with a tag that reads "Knives", "Spoons", or "Forks". Another option is to paint a picture on it of a spoon, knife, or fork. 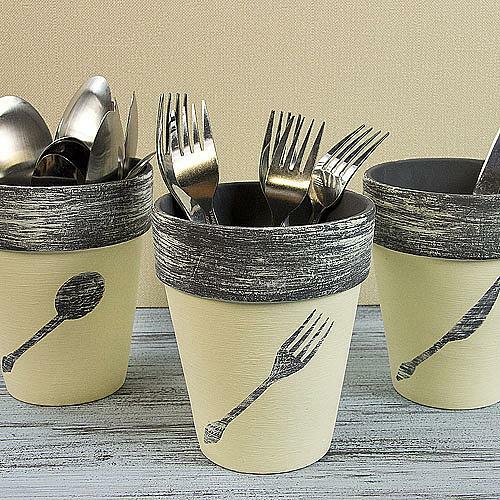 This project is so easy to do, and the result is that your silverware will stay in order. Wind chimes are such beautiful and decorative decorations. Not only do they spruce up your patio decor, but they also make a beautiful tune when the wind blows. 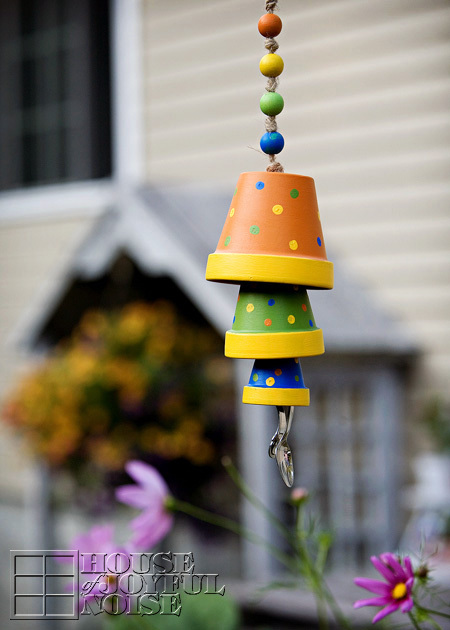 If you are looking for some clay pot crafts, look no further than this clay pot wind chime. You'll need at least three different clay pots of different sizes. Your kids can help you paint the clay pots with creative designs. In order for it to make noise when it is windy, you'll need to attach two spoons to the bottom of the clay pot wind chime. Hang this wind chime on your porch or patio and enjoy watching it sway in the wind. Help feed the birds in your neighborhood by making this easy clay pot bird feeder. It is designed so that the bird seed in the clay pot slides down into the clay plate. This craft will require some drilling, so it may not be suitable for young kids. However, once everything is drilled, your kids can help you decorate it. 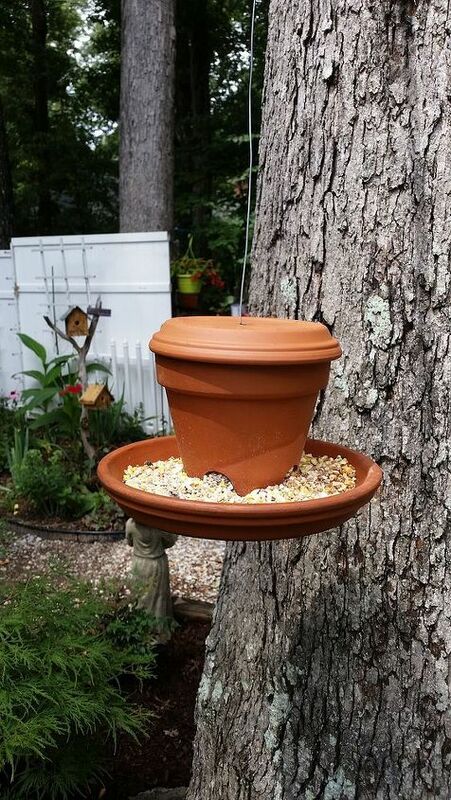 There are so many creative ways to decorate a clay pot bird feeder. You can paint designs on it, add glitter, or leave it the way it is. If you do add glitter, make sure the glitter won't fall off and harm the birds. Do your children love playing with fairy houses? If so, then they may love this clay pot fairy house. With this clay pot fairy house, you can decorate it any way you like. You could glue pebbles on it, or you could simply paint designs onto the clay pot. 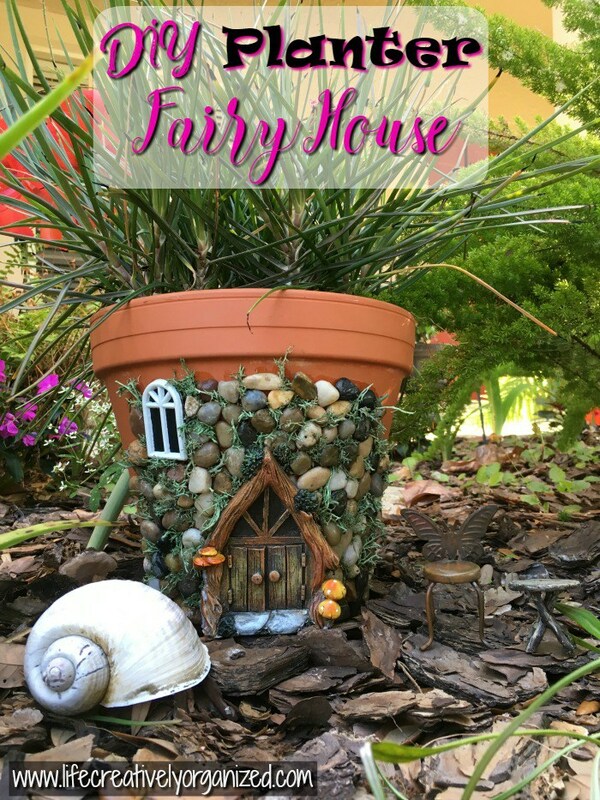 You'll need a larger clay pot for this craft unless you plan on the fairy house being small. This craft is not only fun for your kids to make, but it is also fun to play with. 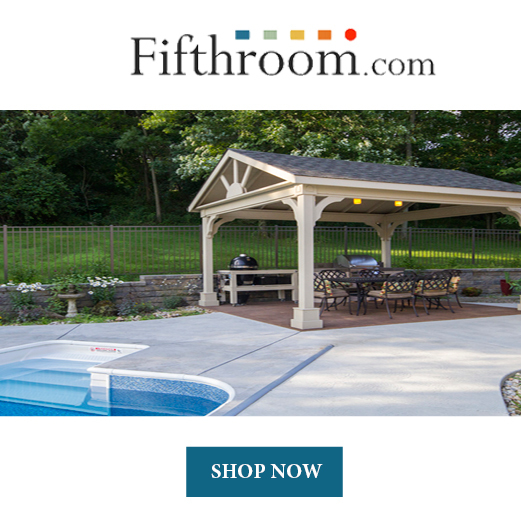 It is a great way to get your kids outdoors and get some fresh air, all the while engaging their minds. There are so many fun clay pot crafts to make. Some of them are for decorating your home, like the clay pot wind chime, while others are useful, such as the silverware organizer. Some even help the environment, such as the clay pot bird feeder for feeding birds. Remember to use your imagination when crafting with clay pots. Even though these clay pot crafts have instructions, you can decorate them in any way you'd like to. These clay pot crafts make great crafts for your kids as well. 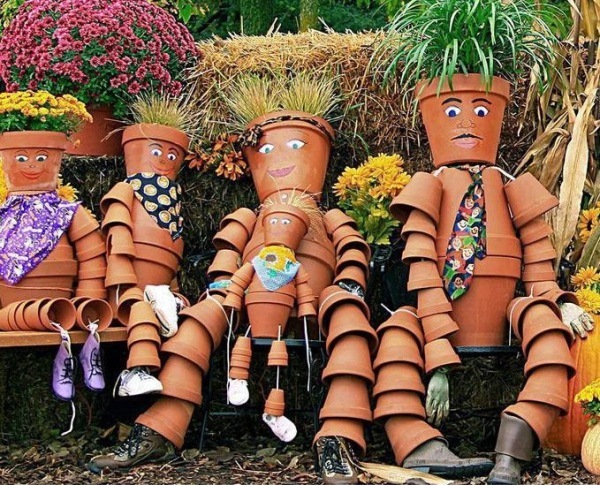 So, the next time you're looking for something for your family to do together, take a look at these clay pot crafts. You'll most likely find something that your family is interested in making. Have fun!